Solar DAO has announced dates for its crowdfunding campaign, offering investors a chance to support the construction of PV solar plant. Energy-focused blockchain investment fund Solar DAO has proudly announced the dates for its two-stage ICO crowdfunding campaign. Both the Pre-ICO and ICO will raise funds which the company will invest into constructing a new PV solar plant. The preliminary ICO will take place between the 27th of July 2017 and the 31st of August 2017. It will be followed by the core ICO, scheduled to start by the end of October 2017. Solar DAO is a closed-end investment fund built on Ethereum blockchain. The company will raise funds with the two ICO campaign and invest them globally in PV solar plant construction, with a particular focus on the Israeli, Portuguese, Kazakhstani and Ukrainian markets, over the next four years. The project was established in 2012, and the development team has worked in the solar energy (photovoltaic) market since 1991. The team behind Solar DAO has already implemented 70 MW PV plants across Europe, developed 270 MW plants in Russia and 150 MW plants in Kazakhstan. They have also implemented four production facilities for PV cells and modules in Russia, Spain, Germany and South Africa. Solar DAO team is currently helping its clients invest in PV solar plants across the globe through UNISOLEX, a Russian entity. The platform has attracted significant multi-million investors in different regions. These solar plants sell electricity to the central grid with special tariffs implemented for up to 25 years and continue to sell for an average market price after expiry. The PV solar plants will be refinanced to construct new plants and subsequently increasing the total installed power capacity of plants run by Solar DAO. When the ICO finishes, major investors will be targeted to buy existing tokens from ICO participants. Solar DAO also aims to payback tokens and sell them to major investors. The Solar DAO ICO campaign will consist of two stages, a Pre-ICO and a core ICO. The Preliminary ICO will run from, July 27, 2017, to August 31, 2017, while the core ICO planned to run on the end of October, 2017. There will be a total available supply of 80,000,000 Solar DAO (SDAO) tokens, with an initial token price of $1.00 per token. 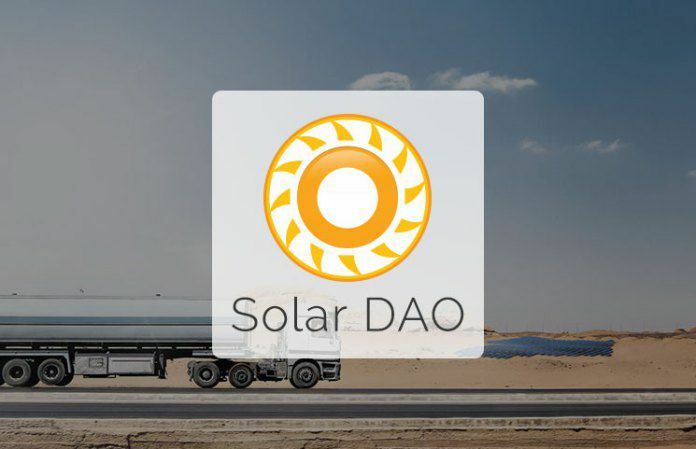 SDAO token holders will benefit from membership in Solar DAO, which comes with full access to 100 percent of the net profits generated by the solar plants, across the globe. SDAO tokens are executed by Ethereum smart contracts for increased transparency and security. Any undistributed tokens will be eliminated through smart contracts, and any release of additional tokens is closed out at this stage. ICO participants will receive tokens in exchange for their investment which entitles them to Solar DAO shares and grants them access to 100 percent of profits from all solar plants across the globe. The profits will consequently be distributed quarterly in ETH to tokens holders' wallets. Solar DAO is closed-end investment fund built on Ethereum blockchain. Built on profit-sharing smart contract, it is dedicated to reducing risks and costs and surpass technical barriers when investing in PV solar plants worldwide. Solar DAO allows individuals to invest in PV solar plants worldwide and get profitability as major investors do. PV plants get profit from electricity sale to the central grid with special tariffs (feed-in-tariff) dedicated for 15-25 years. Solar DAO will raise funds with ICO. Tokens reflect Solar DAO shares and provide dividends distribution for token holders. Solar DAO is the source of this content. Virtual currency is not legal tender, is not backed by the government, and accounts and value balances are not subject to consumer protections. This press release is for informational purposes only. The information does not constitute investment advice or an offer to invest.